Five years ago, I was newly married and taking 220 flights a year. I hardly saw my wife and spent all my time jetting off to meet clients. I accepted a job finding insurance companies in Hong Kong, Singapore and the UK. I had to close sales and that meant meeting as many prospects as possible. Once I’d located them, I had to convert them into paying customers. Having no database to start from, I ended up buying lists. They were awful. I tried hiring interns to make lists. That method failed too. That’s why I was sitting on so many flights. By 2014, I realized I needed to make a change. I needed to find a better way to work. Armed with my degree in Computer Science and AI, but with no real research experience, I started up my own market research company. My main aim was to automate the list-making process. It took me three years to figure out all the ins and outs. By the end of it, I knew I could build the fastest and most comprehensive sales prospecting tool. This is my brainchild: GoPinLeads. The tool combines AI and many data sources to decide on relevant results. The biggest advantage of the tool is that it saves time. Sales professionals spend days researching leads. They might even spend tons of money on hiring staff and interns. The biggest advantage is that it makes sales professionals independent. The tool has the ability to collect thousands of leads from any location in the world. It locates physical businesses and tells you everything about them. You receive their names, numbers, and addresses. Social Media is a modern kind of engagement. Making a database of social media accounts takes forever. Linkedin, Facebook and Twitter accounts are hard to find. You need to put in loads of manual hours of research. GoPinLeads finds you these accounts and gives you all that information at the click of a button. Today the tool is in the hands of our early adopters. It’s saving hundreds of hours and thousands of dollars for sales professionals in Auckland (NZ), Houston (US), Leeds (UK), Istanbul (Turkey), and elsewhere. You won’t need to hire interns, outsource, or buy leads. Install the Chrome Extension and you can start producing your own leads anywhere around the world. Download the Chrome Extension (www.gopinleads.com) and use your 100 free credits. When you are ready to get started, use the discount coupon SMDISCOUNT1111 to get a free XS account for one month. In the realm of management consultancy, strategic planning consultants focus (as is indicated by their title) on the strategic issues faced by businesses. Their focus is firmly tethered to issues relating to anything from supply chains and logistics to Internet presence. While many of these consultants operate under the umbrella of outside consulting companies, more often they are a part of a larger organization offering their consulting services to different units within the company. Strategic planning is driven at the highest levels of an organization, usually formulated by a board of directors with input from expert third parties. The resulting “plans” are officially implemented by the company’s executives. Strategic planning consultants help business owners and their executive teams to develop an integrated strategic plan that builds clarity and consensus on a critical game-plan for future success. A strategy consultant’s role is to provide companies with advice on their goals and future direction. These consultants use expertise, industry experience and analysis to help their clients identify strategies that increase revenue and market share by improving their competitive advantage. Strategy consultants help companies grow faster and increase the value of their business. A strategic planning consultant will endeavor to clarify an organization's objectives and the outcomes required for all key stakeholders including customers, shareholders, staff and community. The resulting strategic plan is formulated within a given framework of corporate policies and procedures, and against economic and regulatory backdrops. A key role for strategy consultants is to help companies define what they do and to identify their capabilities, strengths, and weaknesses. Consultants examine the company’s product range, the skills of its employees, its customer base and its marketing communications to build a picture of its current capabilities. Strategy consultants help management teams compare their current capabilities with market opportunities. They analyse a range of opportunities, compare market requirements with the company’s capabilities and set out a range of viable options. The options might include developing or sourcing new products, expanding into wider geographical territories or entering new market sectors. For each option, consultants highlight the associated risk and identify the changes required for success. Independent strategy consultants are equipped with the expertise and experience of solving strategy problems for small and large businesses across different industry sectors. This perspective and experience can help a management team focus on what the company should do to differentiate itself from the competition. As part of their role, strategic consultants help management teams identify priorities and focus the team on the requirements for making the strategy a reality. Strategic planning consultants will typically call on a range of individuals to bring supplementary expertise with depth of experience in particular areas for example: economic, financial, risk management, marketing, enterprise resource planning, supply chain management, information technology, and human resources. The strategic planning consultant first analyzes an organization's current business practices, both internally and with its customers and suppliers. From the assessments made, the business strategy consultant formulates the objectives, both tactically and strategically. Once the plan has been stabilized and baselined, the consultant works with the executive team on an ongoing basis to implement the strategic plan and manage amendments, usually at specified intervals for example quarterly or annually. The skill requirements of a strategic consultant are extremely high. The complexity involved in formulating an effective long-term plan is immense. Consultants need to find the right avenue that will enable an organization to achieve its stated goals and objectives. Technically, there is no ceiling to the rewards available to the business strategy consultant. They are only limited by their experience, knowledge and contacts. 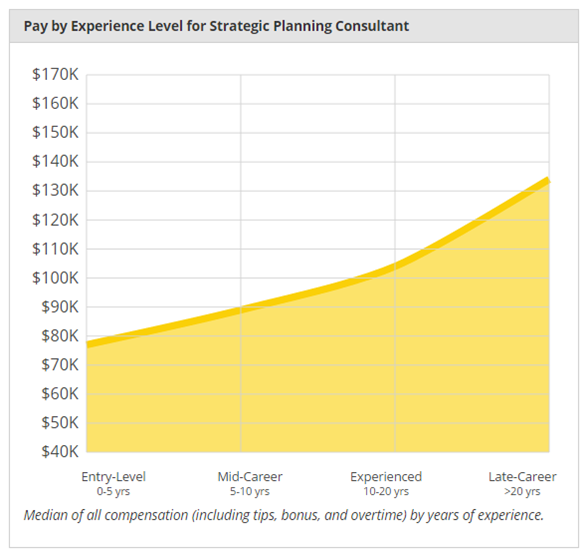 A strategic planning consultant's compensation can quite easily range up in the millions of dollars over the life of an assignment. These fees can be supplemented quite substantially if you hire other experienced, niche consultants to contribute specialist insights. An experience independent strategic planning consultant can make $250K or more in a year without too much difficulty. It is all within their reach given the right experience, knowledge, and drive. The total compensation will be determined by their background and skills. There are also the non-monetary rewards: the kudos of being known as the expert in their chosen discipline and being in high demand among the world's top corporations. The potential in this field is great and very exciting. The demand for skilled consultants is likely to remain high. Competition will be fierce, although the absolute number of credible competitors will be relatively low. Since the formulation of business strategy planning is an ongoing and evolving process, consulting services will be required for a long time to keep the plan current and the organization on track. The extract from Linkedin shows that the range of industries that are interested of services of strategic planning consultants is wide enough. The consulting industry is delightfully complex. Perhaps that is what makes it a highly sought after career for so many people with expert knowledge of any particular business field. In fact, aspirations of becoming a management consultant may even be the driving force behind the quest for knowledge and constant learning. Management consultants are highly sought-after by hundreds of companies spread across several industries for one simple reason: they offer much-needed advice that can turn a business from drab to fab (in a financial sense, of course). There are 5 major fields in management consulting that are highly sought after. Understandably, Fortune 1000 executives are only willing to part with their hard-earned funds for specific types of information. 1.Strategy: BCG, McKinsey and Bain are three of the most well-known consultancy firms specialising in strategy. Strategy consulting is often referred to as “management consulting” in its purest form. Consultants in this particular branch of the field work closely with the CEO and senior management members to solve specific strategic problems which include a decline in profitability, hiccoughs in growth strategy, flimsy market entry, overly slow product development, or responding to competitive threats. 2. Operations: Operations consultants focus on helping clients to improve existing operations. They tend to work on projects relating to supply chain management. This would include simplifying and improving procurement as well as boosting manufacturing efficiency. 3. Information Technology: Organisations are almost constantly looking for digital solutions that will help them compete in an increasingly competitive, technologically advanced environment. IT consultants have the skills required to develop bespoke software solutions, improving efficiency and performance. 4. Human Resources: It comes as no surprise that the biggest expenses in many firms are their wages. Of course, employees should be viewed as a company's biggest asset...and therein lies the conundrum. Balancing expense and value isn't something that occurs automatically, which is where HR consultants come in. HR consultants help organisations to attract the right sort of applicants and then continue the process by selecting, training, compensating, and assessing employees after the initial application is complete. 5. Economic: Economic consultants are generally hired by government and law firms. Their goal is to provide economic forecasts and expert evidence, according to the client's requirements, based on statistical analysis and econometric models. With the consulting industry being as vast as it is, there are certain consulting skills that firms are always on the hunt for. Fortune 1000 execs, in particular, have a list of requirements when searching for a consultant to assist in eliminating their company's woes. Quite obviously, the knowledge and experience of each consultant will vary according to their area of expertise. However, while industry expertise will vary from one consultant to the next, there are certain skills that are sought after across the board. It goes without saying that consultants must be intelligent and energetic enough to cope with high client expectations. Intensely busy travel schedules and tight deadlines are also part of the package. Successful and sought-after consultants always display an eagerness for learning. Each new consulting assignment presents its own set of challenges, and therefore requires the consultant to be able to retain information. While consulting firms endeavour to screen heavily for intelligence and enthusiasm when hiring employees, the firms hiring these consultants on an individual basis tend to be even more thorough. Because consultants work in many different service areas across various industry sectors, they need to be able to communicate clearly, effectively, and persuasively. Consultants are responsible for collecting information from employees, obtaining client buy-ins,and ensuring that proposed solutions are truly feasible. It goes without saying that consultants often work in teams. Generally, they work closely with the client’s senior management team. Being personable, therefore, is an important skill that all consultants need to master. Of course, it isn't all about being agreeable. Consultants need to be assertive, displaying the ability to affect certain outcomes. Consultants need to be able to work with numbers and they need to be comfortable using popular programs like Excel. While it is true that some people are better at maths than others, it is entirely possible (if not completely necessary) for applicants to improve their maths skills through regular practice. Collect and synthesizing large amounts of information are the very foundations of a consultant's career. Management consultants need to develop a hypothesis about their clients' problems in order to discover how best to procure relevant data and to analyze the data to uncover particular insights. They need to employ strong analytical skills to come up with pertinent recommendations. Consulting assignments can seem chaotic due to their multifaceted and fast-paced nature. Consultants need to be able to juggle more than one of these demanding assignments at one time. Strong organisational skills are an absolute must. The ability to take action when necessary and to ask for help when issues arise is of the utmost importance in a consultant's career. Consultants need to be intuitive enough to know when to show initiative and when to take a graceful step back. For quite some time, a generalist approach to consulting was the order of the day. With a few of the head honchos in the industry, like McKinsey and KPMG, adopting this traditional approach it only seems fair to wonder if things will stay the same or if any changes are afoot. Is specialist consulting becoming more popular, or will the generalists continue to monopolize the field? The idea of a consultant who is somewhat of a 'jack of all trades' may have been appealing in the past, but the overwhelming growth of the industry over the last few decades has shed light on some interesting changes. Large firms and corporations are leaning towards specialized input more and more. Consulting firms are finding themselves having to make some serious changes to their consulting career models in order to keep up with the technological advancements going on around them. Consulting firms tend to expect generalist consultants to work on specializing on a particular field within a maximum of three years of joining the firm. Junior consultants are required to be pro-active in managing their careers. It is up to the individual consultant to guide their career in the direction of their chosen speciality lest they be forced into a position they aren't passionate about. It is important to take on as many assignments in your preferred field early on in your career to cement yourself as the expert first within your firm and then within the industry at large. While it may be a highly competitive field to work in, information on becoming a management consultant is relatively thin on the ground. Going from undergrad to consultant requires several smart choices and no small amount of hard work and effort along the way. Knowing where you'd like to work takes you one step closer to setting a solid goal for yourself. Take a good look at the firms you could see yourself working at in the next few years. Figure out whether your ultimate goal is to work for a boutique firm like MCK or Bain, or whether you want to aim high and work for one of the giants like Deloitte. Perhaps you would prefer to keep it local and work for a smaller firm for that "family business feel". The great news is, no marketing consultancy firm is too big or small. Each one brings to the table a set of values that might be in tune with your own career and life goals. This is one of those industries where your network counts for a whole lot more than you would expect. If your aim is to get your foot in the door of one of the major firms, submitting your resume online isn't necessarily the way to go about it. Remember, these firms probably receive hundreds of applications daily. You don't want to simply blend into the crowd. If you don't have a "side door", make one. Reach out to current employees through a well-written email. Ask for a casual chat over a cup of coffee and let them know you'd like to pick their brain about joining the company. Obviously, this isn't an interview but you do need to keep the hint of one in the back of your mind. Don't be too awkward or formal but watch your step. You don't want to be painfully casual either. Remember, this is your chance to make a good first impression. Mention that you're aiming for a career in management consulting and think of a good reason why. Be memorable. Get taken seriously. Keep boring, generic responses to a bare minimum. Instead, think up some fabulous questions about the person's experience working at the firm. While you're at it, ask for tips on how to move forward and keep your potential application process in motion. What you're aiming for, is to get your resume passed on upwards to the people who really matter. Never underestimate the benefits of legal counsel, particularly in a consulting firm. Of course, we all aim to stay on the right side of the law - nobody actively goes out in search of problems. Unfortunately, the laws and regulations affecting your company are as changeable as the weather. So, you really do need a professional in your court. A legal consultant will be able to ensure that you are up-to-date with all of your legal requirements. Unsurprisingly, a large number of law graduates apply for jobs at consulting firms. They know precisely where their services are needed most. Every business needs some form of legal representation. Hiring a legal consultant covers your bases in so many different ways. A full-time lawyer is somewhat of a ridiculous expense, and the fines involved in shirking your legal responsibilities are equally as expensive. Essentially, what you need is the security of being able to call on your consultant should any issues arise. Hoping that your business won't run into unforeseen circumstances really isn't the safest bet. There is absolutely no room for blind hope in business - being proactive really is your only option. The number of unforeseen circumstances that could arise are numerous, and most of them are related to the personal issues of your employees. A death in the family or serious illness are two potential problems that could arise. In both cases, you wouldn't see it coming. However, irrespective of how surprised you are, you still need to deal with the situation according to the letter of the law. It seems like management consulting professionals never quite escape the plight of being candidates. On average, consultants seem to apply for new jobs every 3 to 4 years; thus never really escaping the interview process. The reasons for moving from one position to the next are numerous. Fulfillment, of course, is at the top of the list, closely followed by financial rewards and recognition. In an industry as volatile as this one, making decisions for the right reasons is of the utmost importance. Weigh up the pros and cons of moving jobs before you commit - you need to be sure that you're doing right by yourself. Figuring out your reasons behind the move will enable you to find the right firm for you. Take enough time to search for firms that fit in with your values and goals. As a management consultant you cannot afford to become a part of a company that isn't a good fit: it's bad for the company and for you. Consider your position before making a move as well. If you're higher up on the food chain, you might find it easier to find a new position than you would at base level. Put your feelers out, do some asking around, make sure you know absolutely everything you need to know. Starting fresh in the consulting industry isn't necessarily an easy feat. If you're looking to join a specific company, you need to do your bit to make yourself an asset. Your success depends largely on your ability to maximise your own chances of success, rather than hoping that the right company will do it for you. Your achievements are important when searching for a better job. Make sure you're armed with facts and stats that bolster your value. Consultants have a fairly serious level of responsibility, and your new firm will want to know that you are capable of tackling the challenge. Surveys should be a staple in every consultant's "tool belt". While data may be easy to find, generally speaking, there are certain more personal topics that aren't necessarily readily available. The Big Four consulting firms - Bain, PWC, BCG, and Deloitte - make use of surveys on a regular basis. Surveys are possibly the most cost-effective and easiest way to garner information from a wide range of panelists. Guessing what customers want is a tiresome process that isn't worth anyone's while. Trying to ask them for their opinions one at a time is a prime example of prime wastage. Sending out a survey means you can potentially reach hundreds of people in one fell swoop. With so many free survey tools available, there is absolutely no reason to miss out. The anonymity involved also tends to make panelists feel as though it's safer to be honest, so you have a higher chance of impartial answers than you do in a personal interview. The data generated by surveys is apolitical and assists in shaping and testing theories. Survey Monkey offers users a list of tips on creating the most effective surveys, which are ideal for consultants who are testing the waters. Before settling down to compile your survey, make sure that your research objective is clear. A cloudy objective won't garner the results you need and any survey you create based on wishy washy principles is time wasted. Give some thought to the results you might expect. What actions will you take based on the results you receive? How will the results affect your strategy going forward. How will you deal with receiving the kind of results you don't want? While you may want a large pool of panelists, remember that mass marketing is no longer as popular as it once was. You need to target your audience correctly. Separate the wheat from the chaff, if you will. In order to properly segment your audience, you need to get a bit personal (though within reason). Consider the demographics that would be most useful in your plight. Organising your survey logically is more important than you might think. Keep your easy questions for the beginning of the survey - treat them as somewhat of a warm up. Put the difficult questions in the middle, and then end off with a few more easy questions. Think of the whole thing as a session at the gym. Make sure to keep your questions as short and as simple as possible. You need to be sure that your respondents understand you clearly. Try to avoid open-ended questions if you can as they aren't always good in terms of generating accurately measurable data. Be sure to keep your own opinions out of the questions. Leading respondents to your preferred answer will be considered a cheap shot and reflect negatively on your consulting skills. Do your best to think like a marketer and you're almost guaranteed to make a success of the survey process.